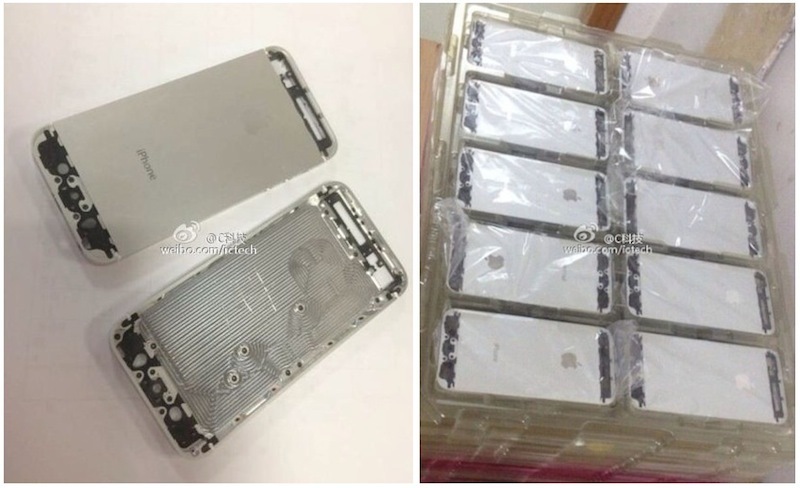 Earlier this week, a user on China's microblogging service Sina Weibo posted a pair of photos showing what many observers have concluded must be the rear shell of the iPhone 5S, despite the user simply commenting "What is this?" alongside the photos. The photos were quickly picked up [Google translation] by Chinese site EXPreview, which paired them with specific claims about the specs of the iPhone 5S, including a graphics upgrade from the triple-core PowerVR SGX543MP3 to the quad-core SGX554MP4 found in the current-generation iPad, an increase in RAM to 2 GB, a 12-megapixel rear camera with dual-LED flash, support for faster LTE-Advanced data networks, NFC support, and a fingerprint reader. The EXPreview report was soon cited by ExtremeTech, and has been slowly making its way around the rumor community before gaining significant momentum today. The first problem is with the photos themselves, which appear to actually show a rear shell for an iPhone 5, not an iPhone 5S. The key point is the layout of the three main screw holes where the logic board attaches to the bed of the shell. The layout of these screw holes matches up perfectly with the logic board of the iPhone 5, but is inconsistent with screw holes seen on iPhone 5S parts leaked so far. 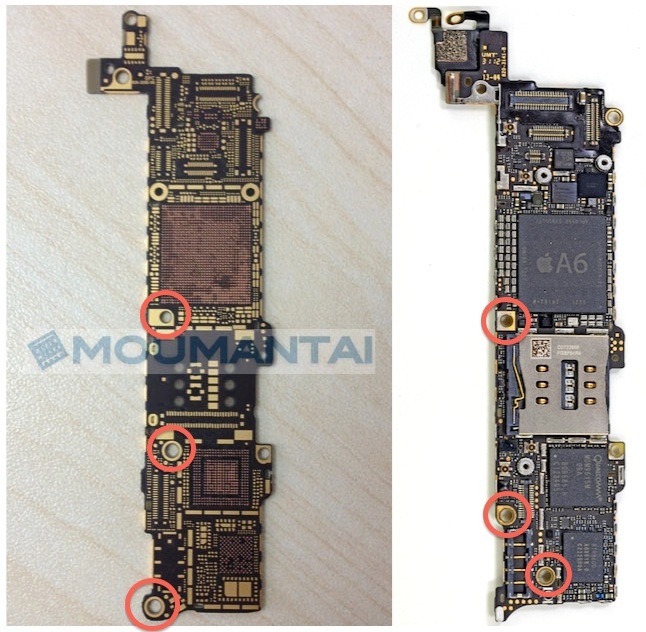 The iPhone 5S logic board was first seen as a photo leak of the bare board last month, revealing that the layout of the main screw holes has shifted, with the most obvious difference being the bottommost hole moving to the extreme lower left corner of the board rather than being more centered and set in a bit from the bottom of the board as seen on the iPhone 5. Our own leaked photos of an iPhone 5S prototype indeed show a screw hole at the bottom left corner of the logic board. As for the specs, they appear to simply be a summary of many previous rumors and are extremely unlikely to be based on any specific information. Rumors of a 12-megapixel rear camera and LTE-Advanced support have surfaced from other sources. Our photos of the prototype show the dual-LED flash next to the rear camera and contradict EXPreview's claim of 2 GB of RAM, as part numbers on the device's main chip point to it carrying 1 GB of Elpida DRAM. So while some of the alleged specs may prove to be accurate, we believe the site's claims to simply be a case of summarizing nearly every possible rumor already floating around. i hope these are real.. I've always wanted the plain colour aluminium with hopefully black glass - like the macbook pros/ipod touch. These are for the white iphone 5. You can see the white antenna spacers on the side. So basically all the rumor sites are starting to listen to each other and report it as news. Great. They're probably the shells of the white model, which has uncoloured anodised aluminium as the main finish. can you highlight where exactly? I bet it's hard to do. Where should the antenna go then? Well I recall reading that the liquid metal technology would allow for better antenna reception so that would get my vote if true. Failing that, I actually really like the look of the plastic shells that have been leaked, however unpopular that may be. The circuit board for the "5s" lines up with the screws for the plastic "iPhone" shell. APPLE and many others call it vision, roadmap, and focus. I really don't understand it, whatever Apple, and many others, call it. I think if Apple doesn't add some stuff to their vision, focus, and road map, people will start to go elsewhere. We're not talking about every size and shape under the sun, just 2 (like they do with everything else).